What surprises does our third episode have in store? Well, all three players are in contention, which is nice – and Bill has a healthy lead despite dropping a ton on Daily Doubles. This one’s straightforward, making my job easy. Bill should wager 4,800 to cover a double-up by Erica. 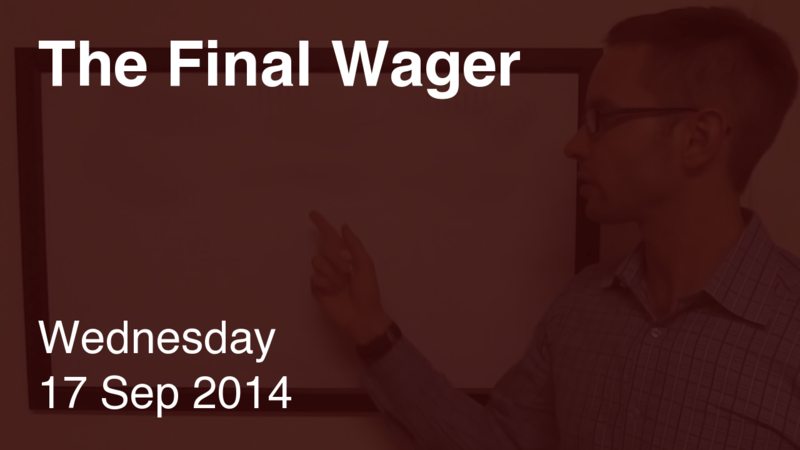 If he gets it wrong, he’ll have at most 7,200, so Erica should cap her wager at 1,200. Howard needs to get it right to have a shot, so he should wager everything. Erica must wager at least 4,000 to cover Howard; she’ll lose to Bill if she’s wrong, so she might as well go all-in. Three episodes, no mind games. I’m fine with that. I’m not fine with Erica’s wager, however – unless she and Howard had some sort of agreement to tie at 12,200, or Howard mentioned he was going to leave off 200 on the downside. Even if that had been the case, why take the risk? We have our first two-day champion in nearly two weeks! Congrats to Bill.